Readers who know me personally also know that I have been (probably appropriately) preoccupied for the last 18 months or so with my no-longer-new job as the Senior Evaluation Officer at The Oregon Community Foundation. In this role, which is very possibly the best evaluation job I have ever had, I am managing the evaluations of several of the Foundation’s larger and more proactive statewide initiatives. In doing so, I have the privilege of working with amazing grantmaking staff AND an incredible research and evaluation team (BTW – both groups deserve credit for hard work and feedback on what I’m sharing in this post). I hope to share more about how we’re doing our work and what we’re learning in the months ahead, but today I want to share a little bit about just one aspect of our work – supporting grantee learning. Through each of the proactive initiatives we’re evaluating, the Foundation hopes to build networks and support collaboration between the funded organizations and within their “fields” more broadly. To do so, each initiative has a learning community component, which calls for the grantees and other stakeholders to participate in activities both in person and from a distance. One goal of our evaluation work is to support the learning of the grantee organizations funded through each Initiative, which happens through a range of activities — from providing fairly traditional evaluation TA, to helping the grantees to engage with and learn from each other, to sharing what we’re learning through our evaluation work, to assessing whether this learning is happening (so meta!). This also means considering how we can creatively summarize and visualize what we’re learning, which we all know supports use of that information! Obviously, there is a relationship between the learning we’re supporting and the learning community activities. 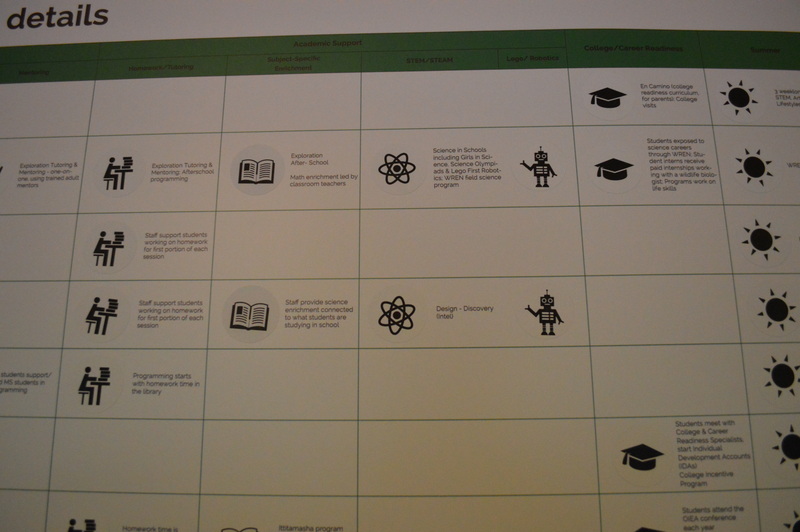 This post is an attempt to share an example of how we supported learning in least two of these ways described above at once, during a learning community gathering earlier this year. But first, just a little more context. The K12 Student Success Initiative is funding out of school time providers who are working to expand and improve their work with middle school students. Through this Initiative there are currently a total of 21 grantee organizations providing a wide range of types of programming in various formats (think mentoring, after school STEM/STEAM programming, summer programming, tutoring, etc.). The K12 Student Success grantee programs are also spread all over the state of Oregon, and many of the leaders and staff don’t have an opportunity to interact with one another regularly. While the variety of programming funded makes for a number of interesting evaluation challenges, it can be especially tricky to simply describe what the grantees are doing in a concise but complete way. So, this spring during an in-person gathering of K12 Student Success Initiative grantee staff and leaders, we pulled together what turned out to be a pretty effective way to summarize and visualize some of what we’d learned in the past year or so, and also to help grantees learn about one another and their programs. We compiled all the information we had about grantee programming components (e.g. 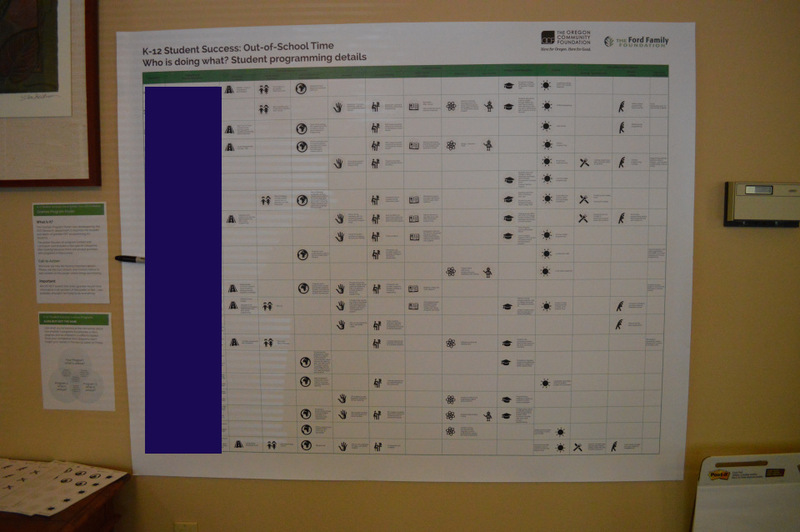 mentoring, cooking/nutrition, STEAM) into a GIANT table on a GIANT poster heavy with icons to help folks navigate the large amount of information contained on the poster (K12 program poster explanation). This helped us organize the information we had about each of the grantees and their programs, and we knew it would eventually be a good way to share more about the “how” of their work with other stakeholders. To encourage attendees at the gathering to actually engage with the poster (we both wanted them to learn about each other and to fact check our work! ), we devised and incentivized (with a drawing for relevant books) an activity to accompany it — Venn diagram activity. We can’t take full credit for the activity — it’s a fairly Google-able concept — but I think that coupling it with the poster (and free books) made for a winning combination. The execution was relatively simple — the hardest part during the event was probably securing it to the wall. We hung the poster up in an area just outside the meeting rooms, with markers and extra icons handy and instructions and handouts right next to the poster. We also had an awesome emcee (bob) who made sure to announce and remind folks about the activity and the book drawing regularly throughout the event. Happily, I can report that not only did the grantee leaders and staff in attendance engage in the activity and with the poster (correcting our work in a few cases! ), they also reported that they appreciated the opportunity to connect with one another in this way. And, as a cherry on top, the other stakeholders we’ve shared the poster with have also found it digestible and useful – if nothing else it very quickly gives viewers a sense of the (extensive) scope of the work happening through the Initiative. I’m counting it as a win in qualitative data visualization! Has anyone else done something similar? Do you have any feedback or ideas that might help us further strengthen this way to share information? Previous postDesigning Effective Surveys Begins with the Questions BEFORE the Questions!